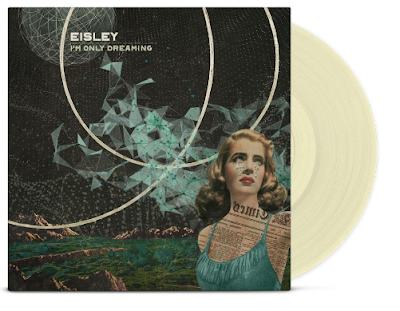 First thoughts on Eisley's "I'm Only Dreaming"
Eisley's new album "I'm Only Dreaming" drops today! But it has been streaming on YouTube for a couple days, so I've had a chance to spin it half a dozen times already. I ordered the "opaque oatmeal" vinyl version, but haven't gotten it yet. Thankfully the album is now also streaming in full on Bandcamp (below & the best place to buy if you are a digital-only person). My initial reaction? Exceptional. "I'm Only Dreaming", the 5th Eisley full-length (along with countless EPs), might already be my favorite Eisley album, and I like it more than every album released in 2016. Strong words, but I think this might be the album I always hoped Eisley would release when I discovered them in 2002. Back in August of 2015 I wrote this much-read blog post about Sherri's sisters Stacy and Chauntelle leaving the band. It was not necessarily surprising, considering all three sisters are now married with children and live in different places with unique goals. But the lack of surprise didn't mean it wasn't jarring, and I was worried about what Eisley would be without them. Before I continue, let me apologize for the lack of credit I have given cousin and bass player Garron Dupree over the years. Sherri credits him as a co-writer in this informative recent podcast interview, and Garron's bass playing is terrific on the new album. But, this post is about Sherri Dupree-Bemis and the phenomenal job she has done becoming front-and-center and bringing Eisley into a new era of the band. She discusses at length in that podcast what it has been like to take over as sole front-woman after sharing that with sister Stacy for 15 years. Sherri grabs the lead and is more confident than ever, both vocally and lyrically. Eisley has always been very whimsical and imaginary, with songs about fairy tales, dragons, and the like. And while the subjetcs of the songs have changed and taken on more serious topics over the years, Eisley's music remains fun. Some of the best songs on this new album are about her life as a wife and mother. The transition of Eisley from a collaborative family band (it began as four siblings playing together, and remained that way for years) to being driven by the single voice of Sherri is fascinating. This 2011 interview with Sherri and Stacy is a detailed read on how they wrote songs at the time and the progression up until that point. Now the present, with Stacy and Chauntelle having moved on to their own projects (Sucré and Rising Fawn, respectively), Sherri, with the help of Garron and producer Will Yip, have released the most cohesive and mature Eisley album to date. When the 11 songs end it leaves me wanting more. Lyrically what stands out to me the most is the use of first-person, more than any Eisley in memory. The songs are much more transparent, and there is rarely any doubt about who "I" or "you" is. The first lyric that pops in to my head when thinking about the album is, "Just take my hand, just take my small, sweet hand," from the first track. The theme of love and commitment is found throughout the album. Musically, I'm Only Dreaming is a fairly straight forward rock album with intricate production and meticulous detail. This is not an accurate description, but as my wife was hearing it for the first time this morning and we were talking about it in the car, I compared it to Death Cab for Cutie (but as random as that comment was, Eisley does sound more like DCFC now than they ever have). The use of electronic percussion is new, as are guest male vocals (Sherri's husband Max Bemis and Anthony Green). You’ve got that fire even though you’re small." It will be interesting to see how my thoughts on this album grow and change over weeks and years, but in the short term I am thrilled and satisfied.